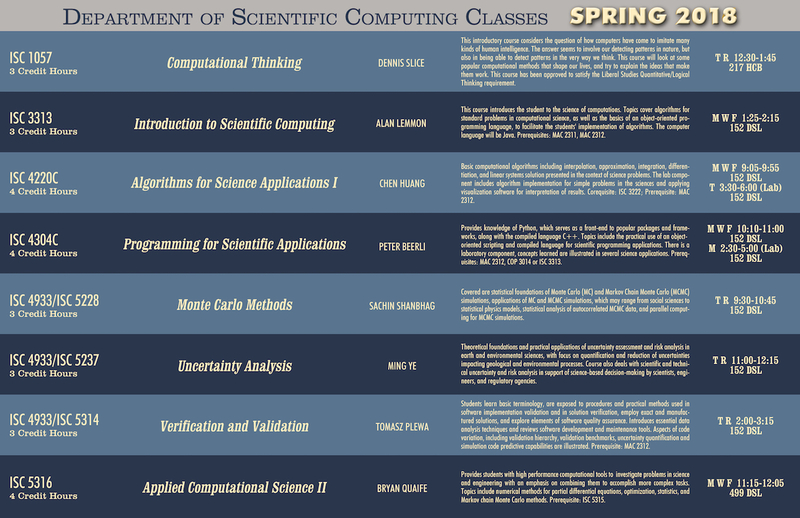 Basic computational algorithms including interpolation, approximation, integration, differentiation, and linear systems solution presented in the context of science problems. The lab component includes algorithm implementation for simple problems in the sciences and applying visualization software for interpretation of results. Corequisite: ISC 3222; Prerequisite: MAC 2312. Provides knowledge of Python, which serves as a front-end to popular packages and frameworks, along with the compiled language C++. Topics include the practical use of an object-oriented scripting and compiled language for scientific programming applications. There is a laboratory component, concepts learned are illustrated in several science applications. Prerequisites: MAC 2312, COP 3014 or ISC 3313. Covered are statistical foundations of Monte Carlo (MC) and Markov Chain Monte Carlo (MCMC) simulations, applications of MC and MCMC simulations, which may range from social sciences to statistical physics models, statistical analysis of autocorrelated MCMC data, and parallel computing for MCMC simulations. Theoretical foundations and practical applications of uncertainty assessment and risk analysis in earth and environmental sciences, with focus on quantification and reduction of uncertainties impacting geological and environmental processes. Course also deals with scientific and technical uncertainty and risk analysis in support of science-based decision-making by scientists, engineers, and regulatory agencies. Students learn basic terminology, are exposed to procedures and practical methods used in software implementation validation and in solution verification, employ exact and manufactured solutions, and explore elements of software quality assurance. Introduces essential data analysis techniques and reviews software development and maintenance tools. Aspects of code variation, including validation hierarchy, validation benchmarks, uncertainty quantification and simulation code predictive capabilities are illustrated. Prerequisite: MAC 2312.